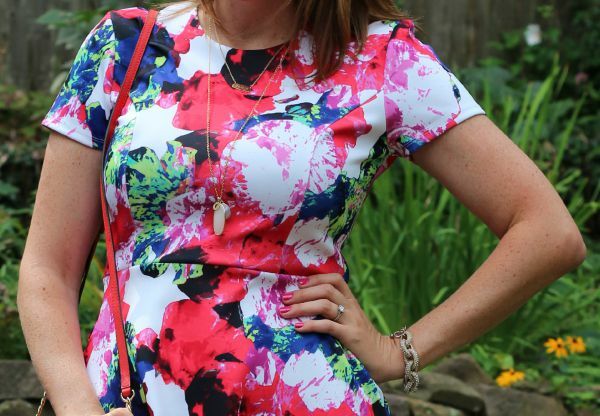 I wore this pretty floral dress to a friend's bridal shower yesterday. The weather was beautiful this weekend. Perfect for walking on the trail and spending time by the pool. My sister Mary Beth's wedding is less than 2 weeks away now, so the excitement is about to start! It was nice to have a quiet weekend as we gear up for all of the fun. I've been fighting off a cold all week and poor Ethan has a touch of it, too, so we definitely needed the extra rest. I found this Milly for Kohl's dress in the sale rack at my Kohl's a few weeks ago. This was one of the dresses that I had my eye on when I first checked out the collection a couple months ago, but it sold out online before going on sale, so I really lucked out by finding it in the store! I paired it with comfy black wedges and simple necklace layering. This is actually the second time I wore this dress. The first time was for Mary Beth's bridal shower last month...so it's basically my bridal shower dress! I've really been enjoying the Designation collections at Kohl's. The next one will be the Thakoon collection, which comes out September 10th. I'll be sure to check it out and report back! This dress is so pretty! Perfect for a fun event like a bridal shower!